The Motivation Dedicated Tricycle is hand powered. Built on the platform of the WM3 wheelchair it provides some postural support to the user. It has a height adjustable footrest, pedals and backrest so that the user can have an optimal riding position and maximum comfort. It has a basic cushion, sculpted backrest and comes with a built in rear carrier. The Motivation Dedicated Tricycle is a flat-packed active style hand powered tricycle based on the WM3 wheelchair platform. It consists of a tubular mild steel frame, with standard bicycle components. It has a single 20” pneumatic wheel at the front, parking brakes and running brake and inline pedal cranks for propelling by hand. It helps the user to travel greater distances with less effort. The user also gets some of same benefits featured on the WM3 wheelchair such as postural support and adjustable footrest. The tricycle has been designed so that it is easy to maintain or repair and uses many standard bicycle parts. One boxed flat-pack tricycle kit can be adjusted to suit most riders. 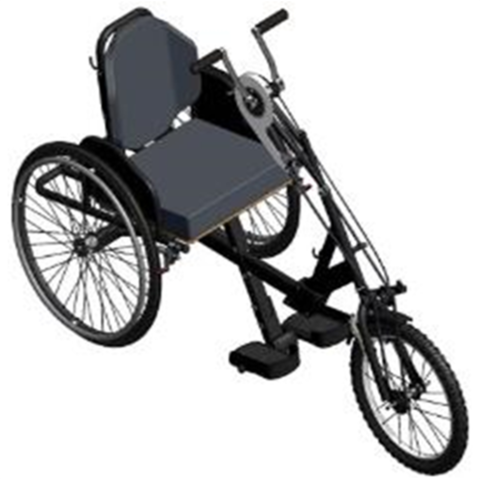 The tricycle is individually assembled and fitted to each user by trained staff. The packaging is designed for easy disassembly for recycling or reuse.